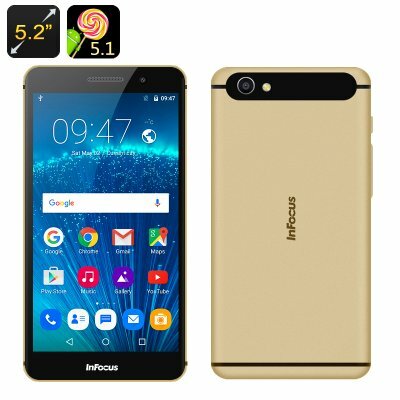 Successfully Added InFocus M560 Android 5.1 Smartphone - 5.2 Inch 1080P Screen, Octa Core CPU, 2GB RAM, 128GB SD Card Storage, 4G (Gold) to your Shopping Cart. InFocus have addressed the need for storage on their latest Smartphone, the M560. This octa core CPU device with 2GB of RAM has an impressive performance but really shines with its 16GB of onboard storage and micro SD card slot offering 128GB of external storage support. That a huge amount of space that will let you store plenty of HD movies, games and loads more. As the InFocus M560 Smartphone has 4G SIM card support so you can access the fastest mobile data rates, this will allow you to stream HD video direct to the Smartphone and with a 5.2 inch 1080p display you couldn't ask for a better picture on your mobile device. Running on an Android 5.1 operating platform the phone boasts a fantastic user interface and that lovely screen has 10 point support that responds beautifully to the touch. Added to all this the M560 Android phone offers OTG support and has two cameras for capturing memorable moments in such quality you can leave your point and shoot at home. To make the complete package this powerful Smartphone has been given a luxurious body that fits comfortably in the hand and is sure to make your friends envious, especially when you tell them the unbelievable price. With a golden finish the InFocus M560 Smart phone ticks all the right boxes and comes with a 12 months warranty, brought to you by the leader in electronic devices as well as wholesale Android Smartphones..